On October 16 and 17, 2014, the Parishes of St Anna of Novgorod and the Holy Princess Olga celebrated together the millennium of the baptism of St Olav, the King of Norway Equal-to-the-Apostles. 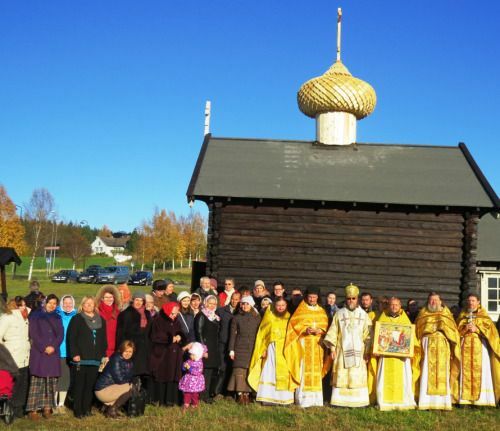 The website of the Parish of St Olga of Novgorod in Trondheim reports that on the day of the baptism of St Olav, October 16, 2014, Archbishop Mark of Yegoryevsk, head of the Moscow Patriarchate office for institutions abroad, celebrated the Lesser Blessing of a Russian Orthodox church dedicated to St Olav, built in the historic place in Stiklestad in central Norway, and the Divine Liturgy in it. 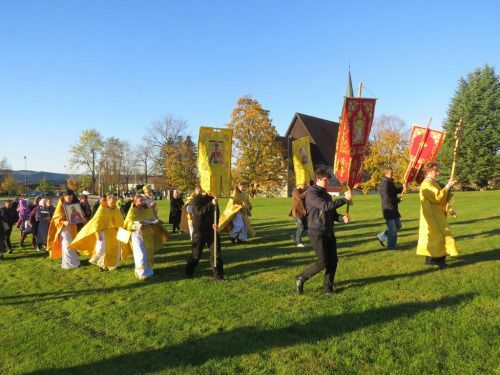 The celebrations started with a procession with the cross as the clergy and numerous pilgrims marched with the icon and relics of the Baptiser of Norway through the Stiklestad Field to the newly-built church. After the service, awards were presented to those who distinguished themselves in the construction of the church. In his address, His Eminence Mark warmly thanked the rector, Father Alexander Volokhan, the parishioners and all those who worked hard to build the church in Stiklestad. On October 17, the Orthodox clergy led by Archbishop Mark celebrated the Divine Liturgy in Nidarosdomen – the old cathedral in Trondheim, the place where the relics of St Olav have been kept for centuries. Taking part in the service were Father Alexander Volokhan, rector of the Parish of St Anna of Novgorod in Trondheim, Archpriest Igor Aksenov, and Father Sergiy Bondarev, rector of the Parish of St Alexander Nevsky in Copenhagen. After the liturgy, a procession with the cross and an icon of St Olav was held around the cathedral.